Wholesale Trader of a wide range of products which include two stage hand pump. Backed by our rich industry knowledge, we are distributing and trading Two Stage Hand Pump. The offered pump is extensively demanded owing to its energy efficiency, resistance towards wear & tear and high tensile strength. It is robust in terms of construction and ideal for heavy-duty usage as well. This pump is extensively used in automobile and heavy machinery industries. 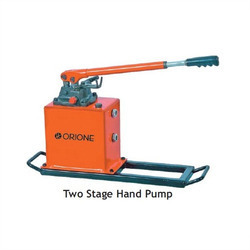 Looking for Two Stage Hand Pump ?